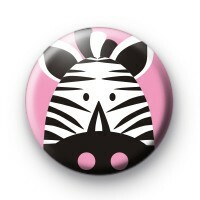 Pink Zebra Button Badge featuring a really cute zebra illustration on a white background. This is a really Cute animal badge hand made in our UK workshop. If you love Zebras and Safari this is the ideal badge. We have a huge range of animals badges, perfect for animal lovers & school children learning about nature. Be sure to check them out. Standard 1 inch badge hand made in our UK workshop using manual badge presses & locally sourced badge components.